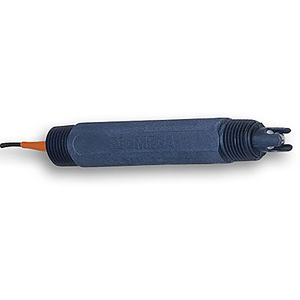 The PHE-7357 sensor is designed for use in most water and waste water applications. The large reservoir of reference electrolyte, coupled with the non-fouling nature of the Porous PTFE liquid junction, assures a long life in general service. The sensor body reduces the risk of accidental breakage during installation and maintenance by the inclusion of protective lobes around the sensing element. Also available for ORP measurement. Use of the high temperature version is recommended where service temperatures exceed 80°C (176°F). PHE-5551 is a double-junction construction with solution ground in a robust PPS housing, being highly resistant to electrode poisoning solutions. 참고: Comes complete with electrode care instruction sheet and 3 m (10') of cable. For non-standard cable lenths, change the "-10" in the model number with required length in feet, add $2 per foot to price. (Additional per foot cost applies to the entire cable length). For HF/Fluoride resistant option, add suffix "-HF" to model number, add $50 to price. For high temperature reference cell (standard on PHE/ORE-5551), add suffix "-HT" to model number, add $35 to price.